There are no official statistics concerning the numbers of memberships of the different religious communities in France and each religion or denomination has its own way of counting its members. According to the 2017 survey, only 3.1% of the Frenchmen are Protestants (which includes historical Protestants and people declaring themselves as belonging to Evangelical churches). 56% of those who declared being Protestants are Lutherans or Reformists, 30% are Evangelicals, Pentecostals or Charismatics and 14% have no opinion on that matter. 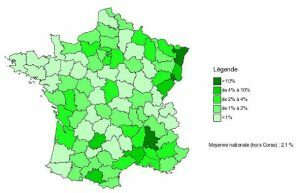 On this map, one can see the geographical breakdown of the Protestants in France. Of the 420 ministers one third are women. There are 480 local churches. 45 500 people participate financially. In 1905, the seperation of church and state was established. Today there are organisations that represent Protestantism in France: The Protestant Federation of France (FPF) and the National Council of the Protestants of France (NEF). Protestants are engaged in society as they are also citizens. The Protestant church gets involved in specific topics and Protestantism can be a model for dialogues and debates.